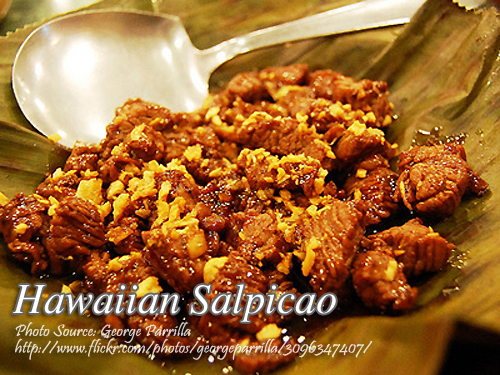 This salpicao dish is Hawaiian inspired that is why it is called Hawaiian salpicao. The pork contains pineapple chunks, tofu, spices and seasonings. I wonder why dishes with pineapples are called Hawaiian since not every dishes in Hawaii contains pineapples. I just assume that since pineapples are abundant in Hawaii that is why some people name dishes with pineapples “Hawaiian”. To cook Hawaiian salpicao; Marinate pork for 30 minutes. Drain and reserve any marinade. Sprinkle meat with flour. Brown in olive oil. Set aside. In the same pan, sauté half of garlic until light brown. Reserve some for topping then add marinade, pineapple syrup and pork. Season with salt to taste. Simmer for 2 minutes. Add remaining garlic, tofu, leeks and DEL MONTE Fresh Cut Pineapple Chunks. Cover and simmer for 3 minutes. Top with fried garlic. To see the complete recipe with list of ingredients in exact measurements, continue reading. Marinate pork for 30 minutes. Drain and reserve any marinade. Sprinkle meat with flour. Brown in olive oil. Set aside. In the same pan, sauté half of garlic until light brown. Reserve some for topping then add marinade, pineapple syrup and pork. Season with salt to taste. Simmer for 2 minutes. Add remaining garlic, tofu, leeks and DEL MONTE Fresh Cut Pineapple Chunks. Cover and simmer for 3 minutes. Top with fried garlic.